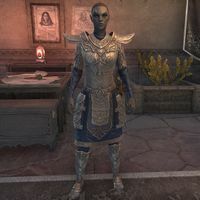 High Ordinator Vermethys is a Dunmer soldier who can be found in the Hall of Justice of Vivec City. "Do you know who I am? High Ordinator of the Order of War? Does that ring a bell? Sigh. Why we allow outlanders into Vivec City at all is beyond me." "Outlanders! Who else but the ignorant savages from other lands would barge into my office and expect to be able to just speak to someone of my stature? Incredible. No offense intended, of course." "If you don't have any business here, then move along. I almost called you scum, but I'm trying to change that habit." Vermethys is the author of Crafting Motif 49: Militant Ordinator. This page was last modified on 16 August 2018, at 19:25.